An End to HIV by 2030? In his recent State of the Union speech, President Trump made an ambitious pledge in the area of public health: to eliminate the HIV epidemic in the United States within ten years. The actual plan, released that week by the Department of Health and Human Services, aims to end new HIV infections by 2030. 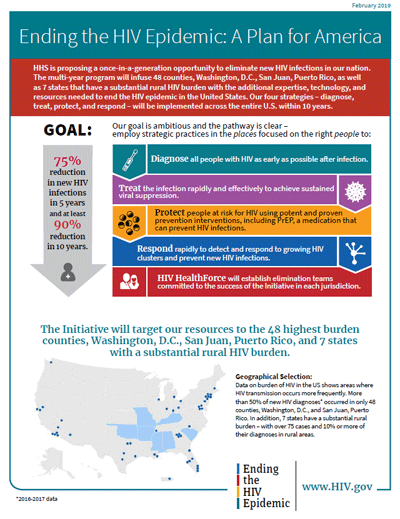 HHS proposes to do this by targeting “geographic hotspots”: forty-eight counties, plus Washington, DC and San Juan, Puerto Rico that account for more than 50 percent of new HIV diagnoses, as well as seven states with high rates of infection in rural areas. The plan calls for diagnosing the disease quickly, starting treatment as soon after as possible afterward, and increasing the use of PrEP (pre-exposure prophylaxis), a medication for people at high risk for HIV. Researchers and HIV/AIDS advocates call the initiative aggressive but achievable, as all of its medical components—diagnostics, anti-retroviral therapies, PrEP—have been available for some time. However, many remain skeptical of the Trump administration’s actual level of commitment to ending HIV, given its ongoing assault on LGBTQ communities, immigrants, and people of color, populations with high rates of new infections. Furthermore, the administration has continually attacked and undermined the Affordable Care Act and Medicaid, making health insurance both more difficult to obtain and more expensive to use. Premiums continue to rise, and seven states have implemented work requirements that have had the effect of kicking people off Medicaid, with applications pending in eight more. As both a social and a medical endeavor, public health must engage communities, where local norms and cultural attitudes can affect disease transmission. Take for example the recent measles outbreak in Clark County, Washington, a state that allows exemptions to mandatory vaccinations for medical, religious, and philosophical reasons. As NPR has reported, some schools have vaccination rates under 40 percent, rather than the 90 percent or so required for a community to be protected. Parents who are responding to inaccuracies and rumors on social media and from other parents forego vaccinations for their children, placing entire communities at risk. Combating such fears requires not only a tightening of applicable laws, but also a campaign to address vaccine misinformation in locations where it can itself spread like a virus. If the Trump administration is truly committed to eradicating HIV, then it must combine social with medical approaches. It’s not enough simply to diagnose more people and subsidize new PrEP prescriptions. Resources must also go toward affordable housing, nutrition assistance, and counseling to ensure that patients are emotionally supported and are adhering to regimes of treatment. Stigma and discrimination remain obstacles to meaningful care in affected populations; any far-reaching plan must tackle social attitudes among those affected, including families and healthcare providers. We may have in hand the medical tools to end new transmissions, but success will not rest on these components alone. The Trump administration must understand this if it genuinely wants to succeed in its goal. The recent announcement that Theranos CEO Elizabeth Holmes has been banned from the blood-testing industry for two years is the latest chapter in the company’s rise and fall, a cautionary tale in what can happen when media hype and millions of dollars in investment funds collide with the revolutionary but untested claims of a driven, dynamic founder. Until Theranos came under scrutiny from federal regulators, much of the laudatory press coverage focused on the company’s origin story—the turtleneck-clad Stanford dropout who idolized Steve Jobs and wanted to change the world through technology. Holmes landed on the covers of Fortune, Forbes, Inc. and T: The New York Times Style Magazine, and the New Yorker and Wired published lengthy profiles. At its peak, Theranos was valued at $9 billion, making Holmes the youngest self-made female billionaire in the world, at the helm of an enterprise whose board was packed with luminaries including Henry Kissinger and former Secretary of State George Shultz. The excitement over Theranos was based on its claim of proprietary technology that, if real, had the potential to revolutionize lab testing and the healthcare decisions that are based on it. But at the core of its vision was a less sensational though equally central premise: that direct-to-consumer blood testing is the future of American healthcare. As Holmes put it in a 2014 TEDMED talk, enabling consumers to test themselves for diseases before showing any symptoms would “redefine the paradigm of diagnosis.” By determining their risk for a condition before developing it, people could begin treatment at an earlier stage. Take, for example, Type 2 diabetes, which Holmes says drives 20 percent of our healthcare costs and can be reversed through lifestyle changes: 80 million Americans have a condition called prediabetes, and most of them don’t know because it generally produces no symptoms—no headache, no muscle pains, no nausea or fever or chills—and is detectable only through a blood test. The removal of the subjective experiences of the patient from the act of diagnosis has been a part of medical practice since the mid-1800s, when the modern stethoscope made it possible to observe the internal workings of the body in a non-invasive way. By the beginning of the twentieth century, an assortment of new instruments gave doctors access to technical information that patients could neither see nor interpret. The laryngoscope and electrocardiograph offered data independent of an individual’s perceptions, while a new device to measure blood pressure found its place in the doctor’s medical bag. Hemocytometers and hemoglobinometers enabled microscopic examination of the size and number of blood cells, allowing hematologists, as these specialists became known, to read the blood and manipulate it to treat various disorders. Together, these instruments reduced the physician’s reliance on a patient’s subjective description of symptoms in favor of precise, quantifiable data. As diagnostic technologies have grown more sophisticated, a number of symptomless conditions have appeared that didn’t previously exist. Many of these are defined by deviation from a numerical threshold: high blood pressure, for instance, or prediabetes. But as physician and historian Jeremy A. Greene has written, these numbers can change due to shifting medical opinion or adjustment by pharmaceutical companies, which have an incentive to make the population of patients who are candidates for their drugs as large as possible. When the American Diabetes Association lowered the threshold for prediabetes in 2003, the population of prediabetics instantaneously expanded. No one’s health changed that quickly, just our definition of which patients had a condition and who should take medication for it. The assumptions underlying a medicine-by-numbers approach are that disease is detectable with diagnostic instruments before the onset of experiential symptoms, and more data is always better. Our blood does contain an immense amount of crucial information about our well-being, from levels of vitamin D and electrolytes to the presence of bacteria and antibodies. But as the history of blood testing shows, the idea of blood as an infallible roadmap to one’s health, a substance that with the proper analysis will inevitably reveal incipient disease, has not always held up. More data is not always more useful, especially if we lack the tools to understand it or if the medical meaning of the information is in flux. Three separate readings of the CA 15-3 biomarker for breast cancer may look nearly identical to a physician, writes Eleftherios P. Diamandis of the University of Toronto, but in a patient could prompt a range of reactions from anxiety to jubilation, depending on where the numbers fall as predictors of cancer recurrence. Defining diseases solely by numerical thresholds invites the possibility that these numbers could be manipulated, and with them the boundary between health and disease. Today’s normal cholesterol might be tomorrow’s borderline hyperlipidemia. Numbers-based medicine may hold enormous appeal in its apparent ability to translate the opacity of blood into quantifiable data, but treating every out-of-range figure as a marker of proto-disease is no guarantee that we’ll end up any healthier. We may just end up with more information. Eleftherios P. Diamandis, “Theranos Phenomenon: Promises and Fallacies.” Clinical Chemistry and Laboratory Medicine 53, 7 (June 2015). Jeremy A. Greene, Prescribing By Numbers: Drugs and the Definition of Disease. Johns Hopkins University Press, 2006. Keith Wailoo, Drawing Blood: Technology and Disease Identity in Twentieth-Century America. Johns Hopkins University Press, 1999. As the Zika virus spreads north from Latin America, Central America and the Caribbean, the list of public health recommendations and scientific unknowns continues to grow. Zika is not new; it was first identified in 1947 in Uganda, and although scientists have found consistent evidence of antibodies in primates since then, few documented cases were reported in humans until recently. Current statistics are grim: the virus has now been confirmed in over thirty countries in the region, with hundreds, perhaps thousands of additional cases likely in the coming months as mosquito season peaks in the Northern Hemisphere. Although Zika has been linked to a number of health issues, including fever, joint paint, and Guillain-Barré syndrome, most adults who are infected will have mild symptoms, if any, and no lasting effects. The risks for pregnant women, however, are more severe. The virus has been found to cause microcephaly, a condition in which babies are born with abnormally small heads, leading to brain damage and developmental issues. Mounting fears of a virus for which no vaccine or cure exists are prompting increasingly dire warnings from public health agencies, including the World Health Organization, which recommends that pregnant women avoid traveling to areas of ongoing Zika transmission. Officials in a number of affected countries have advised women to postpone pregnancy for a period of months or years; in El Salvador, health ministers have told women not to get pregnant until 2018. We don't know how likely she is to get Zika. We don't know how likely it is that Zika will pass to her fetus. We don't know if the fetus is infected, if the fetus will develop birth defects. We don't know when in pregnancy the infection might cause harm to the fetus. We don't know whether her baby will have birth defects." While I’m by no means trying to minimize the implications of having a baby that tests positive for Zika or a child with microcephaly, I find that the uncompromising public health recommendations around the virus’s transmission are a reflection less of the absolute risk to a pregnant woman (which we lack the information to conclusively determine) than of the inadequacy of what medicine can offer in the event of infection. The anxiety surrounding the virus is understandably based in fear and uncertainty, as pregnancy is a 40-week state of perpetual uncertainty that entails a constant balancing of input versus outcome. As with alcohol and caffeine, which pregnant American women are advised to avoid entirely, there is no safe level of exposure to Zika; one must assume that a developing fetus is at risk, even if the mechanism of infection is not fully understood. I realize that the calculation of risk will be different for women who travel to areas of active Zika transmission and those who reside there. I’m also aware that birth control and abortion are not available to most women in a number of affected countries, including Brazil, and sexual violence and coercion mean that many women are not fully in control of their sexuality. Zika may not be a new disease, but it is a newly emerging threat, and millions of women who are pregnant, thinking of becoming pregnant, or simply of childbearing age will have to weigh questions of risk and responsibility as they make essential decisions about travel and reproduction.